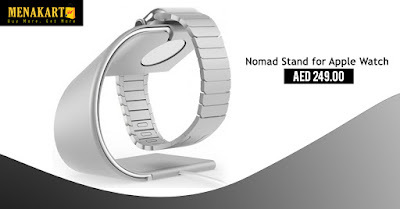 Simply put, Stand for Apple Watch is a minimalist, honest charging stand for Apple Watch. It’s designed to give your watch an elevated charging experience, whether at your desk or by your bedside. Stand is built from a solid piece of extruded, aircraft grade, precision CNC’d aluminum. And its machined non-visible cable routing channel sits discretely on its backside, creating a stealthy passageway for your Apple Watch charging cable. Simply put, Stand is incredibly well built. Hidden above our non-slip, high friction rubber footing lies a solid chunk of copper for added ballast. At over 3 times the weight of aluminum, you'll quite literally feel the difference our copper alloy base makes in keeping Stand appropriately tethered to the surface.